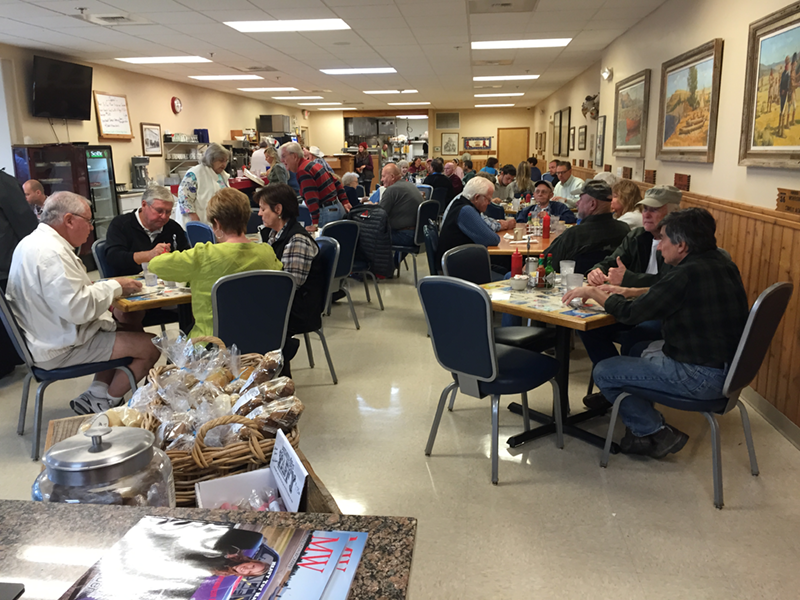 The Sykes Diner has been a Kalispell staple for decades now. During that time there have been many renovations and additions, but it has always remained a friendly place to grab a delicious and filling meal at a great price. Some of our customers’ favorites include Chicken Fried Steak, Biscuits and Gravy, Tomato Basil Soup, several different burgers which are 100% real beef. Our menu includes many other items from a casual diner as well as some fantastic daily specials. Where else can you get a 10¢ cup of coffee with your breakfast? Check out the diner menu below and stop in soon to see what Sykes is all about! Sykes Diner is committed to using fresh, local, and healthy products whenever possible to deliver the best quality food. Come join us for downhome cookin’ and a friendly atmosphere. Hash-browns or home-fries, ham, mushrooms, green peppers, onions and cheddar. Topped with our homemade sausage gravy. Served with two eggs. 2 eggs, 2 bacon, 1 pancake or french toast. BREAKFAST SERVED UNTIL 4:00 P.M.
We use only farm fresh eggs, real russet potatoes and USDA choice cuts of Beef & Pork. Choice of Toast: White, wheat, english muffin, buttermilk biscuit, rye or sourdough. 1 egg, potatoes and 1 piece of toast. 1 egg, potatoes, 1 piece of toast and choice of 2 bacon, ham steak, 2 link or 1 patty sausage. Your choice of bread or homemade biscuit, choice of bacon, ham or sausage patty, cheese and choice of potato. 2 eggs, potatoes, and 2 pieces of toast, choice of 2 bacon, ham steak, 2 link or 1 patty sausage. 2 eggs, 2 bacon, 2 sausage links and choice of 2 pancakes, 2 french toast or 1 waffle. 1 egg, 1 bacon, 1 sausage link and choice of 1 pancake or 1 french toast. 6 oz. sirloin steak charbroiled and served with 2 eggs, potatoes and toast. Chicken Fried Steak smothered with rich brown gravy or creamy sausage gravy. Served with 2 eggs, potatoes and choice of toast. Homemade corned beef hash topped with 2 eggs any style. Beef Brisket, pulled pork, green chilies, potatoes, two eggs and toast. Chorizo, scrambled eggs, cheddar cheese rolled in a flour tortilla and smothered with ranchero sauce, served with potatoes. Flour tortillas topped with black beans, chorizo, 2 eggs any style, ranchero sauce and cheddar cheese served with potatoes. Notice: The consumption of raw or under-cooked egg, meat, seafood or shellfish, may increase your risk of food borne illness. We serve buttermilk pancakes, classic French toast and Belgian-style waffles with fresh cream butter and maple syrup (sugar free available). Add to Pancakes, French Toast or Waffle . . .
Made with 3 farm fresh eggs, the finest meats, veggies and cheeses. Served with choice of hash browns or home fries and choice of toast - white, wheat, english muffin buttermilk biscuit, rye or sourdough. Prepared with farm fresh tomato, cucumber, onion & choice of dressing. Dressing: Ranch, Raspberry Vinaigrette, Honey Mustard, 1000 Island, French, Caesar, Sesame Soy, Oil & Vinegar, Blue Cheese, and Italian. Deli specials come with chips. Upgrade to fries, coleslaw, soup, salad or cottage cheese for $1.00 or choose sweet potato fries for $2.00 or onion rings for $3.00. Choice of fries, coleslaw, soup, salad, cottage cheese or tater tots. Add soup or salad to any Good Ol' Grub for $1.95. Sub baked potato for mashed after 4pm. Choice of toppings: Chocolate, Strawberry, Caramel.